If you live in the Denver Metro area, it’s no surprise that the construction industry is booming. Take a quick scan of the city skyline and you’ll count a handful of cranes on any given day. What’s less apparent, however, is that many Colorado construction companies are desperately struggling to find workers. In fact, a recent survey of industry professionals shows that 56 percent of Colorado construction firms list worker shortages at the top of the list of concerns. The skilled labor shortage is not unique to the construction industry. It’s an issue that affects nearly all —86 percent, to be exact—of Colorado employers. As a state, we know we need to do a better job of preparing Colorado students for their next step after high school, whether that is a certification program or college. 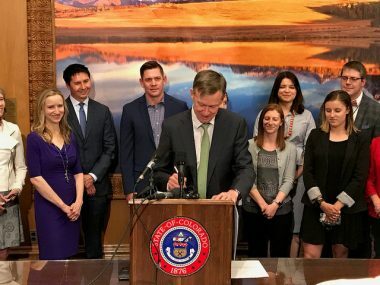 Governor Hickenlooper signs into law legislation to expand the Colorado’s Career Development Success Program. As a construction industry professional and as member of Colorado Succeeds’ Board of Advisors, I have had the honor to be on the front lines of efforts to build more career pathways for students’ success. One such example is Colorado Construction Connection which can be accessed through www.BuildColorado.com, a website that increases awareness of opportunities in construction careers. Completes and passes an AP computer science course. Excitingly, in its first year, demand for the Career Success pilot far exceeded the supply of available funds; Districts and schools reported 3,000 completed credentials, but only 1,800 received incentive funding from the state. There are already great stories of the program’s success statewide, from Salida to Grand Junction to Longmont. The expansion of this two-year pilot program for five additional years gives Colorado schools greater certainty that their investment in these opportunities will be well spent. It will also support more school districts, particularly those outside the Front Range, to participate. In his final signing ceremony of the year, Governor John Hickenlooper signed this important legislation into law, on June 5, 2018. Through hands-on career and technical education—which this program supports—schools can abet and expand relevant education experiences that supercharge a student’s chances of success after high school. This exposure to a career, for example, in the construction industry, helps students not only envision a successful future ahead of them, but also gives them tangible tools to get there. Graduating from high school with a set of in-demand skills and a certificate enables students to immediately plug into the workforce. Having a well-paying job and being able to support oneself right out of high school is a tremendous gift. With this strong footing, students can then choose to further their education, delve deeper into where they started, or even switch careers entirely. Salida student, Caleb Drake, works on the school district’s building trades apprenticeship work site. The Career Success Program clearly offers great benefits to employers as well. Students who have work-based learning experiences and earn industry recognized credentials demonstrate a level of commitment and interest in a profession. As an employer, I am more likely to hire a student with this background because I feel more confident that they have the knowledge and skills needed to succeed on the job. A new hire that has already invested time and effort into a career path shows me that they’re committed and well worth investing in via more on-the-job training and other experiences. All Colorado students deserve an education that is relevant, meaningful, and engaging – one that creates a future full of possibility. I hope you’ll join me in celebrating the expansion of this successful program and, more importantly, helping to spread the word about this great opportunity for Colorado students and employers.